Edgewater really began one day in 1861 when a farmer named Thomas Sloan decided to dig a well on his land in the Colorado Territory. The spot he chose was about two miles west of the growing settlement of Denver. In digging, he tapped into a warm-water spring, and overnight his well filled and continued flowing until nearly 200 acres were flooded. The resulting lake became known as Sloan's Lake. Since his farmland was now under water, Mr. Sloan had to find another source of income. He began to cut ice in the wintertime, which he packed in sawdust and stored in sheds. He shipped the ice to local breweries, and his business prospered. The area just west of Sloan's Lake soon became known as "Edgewater" due to its close proximity to the lake. By the early 1880s, Edgewater was still no more than a few fishing shacks and a stage stop along a cattle trail. It was a swampy region in the empty prairie, with small clumps of brush and gnarled trees breaking the monotony of alkaline mud and tumbleweeds. As cattle being driven from New Mexico to Wyoming watered at the new lake, cowpokes enjoyed the amenities offered at the stage stop. Then, in 1889, a real estate company advertised "a most delightful and elegant area for homes" in the Edgewater area, and a neighborhood began to form. In actuality, it wasn't "elegant" at all - it was boggy, muddy, and barren-but there was a lot of open space. People began to move to the area from Denver to escape crowded conditions and heavy taxes. George Noll, a Denver meat peddler, built one of Edgewater's first houses in 1890. Mr. Noll went on to open Noll's Grocery and Meat Market at what is now 25th and Sheridan, and he did much to help establish Edgewater as a true town. 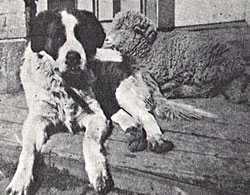 A St. Bernard and a sheep, best friends, would hang out together on the wooden sidewalks in front of the grocery. The store attracted human customers as well; the growing town boasted fourteen permanent homes by the end of 1891. An amusement park named Manhattan Beach was built on the north side of Sloan's Lake in 1891. It included a zoo, dance pavilion, roller coaster, steam ship rides, hot air balloon ascensions, ladies shot from a cannon, and circus acts. Fire, accidents, and competition with Elitch Gardens and Lakeside Amusement Park finally caused Manhattan Beach to close by 1914. Old timers said that Roger the elephant, a former main attraction at the amusement park, is buried down the street from Edgewater Elementary, under a parking lot near 20th Avenue and Depew Street. During this same time, Denverites rode out on sleighs to the lake in the winter to watch a friendly Indian tribe who came down out of the mountains to avoid the heavy snows. Their wigwams dotted the northwest end of the lake, and they frequently made jaunts into Denver for supplies. The City of Edgewater was incorporated in 1901. It was still hardly the "delightful and elegant area for homes" that the optimistic realtor advertised. The small town was actually often considered "an evil den of Lucifer". Partly because of the proximity of the amusement park, and despite the influence of a Methodist mission in town, Edgewater was packed full of saloons, gambling, and houses of ill repute which bloomed along what was then Emerald Street (now 25th Avenue). If the saloons and "soiled doves" weren't enough to keep fashionable ladies from moving in, the mud did. Mud lay ankle-deep on the ground most of the year, occasionally replaced by snow or flying dust and sand. The rich built their luxury homes on higher ground by the northern and southern shores of the lake, distancing themselves from the wild and boggy Edgewater. The families that did settle in Edgewater were, of necessity, practical people, willing to fight "an endless battle against two oceans - one of mud and one of beer", in order to build a respectable town for their families. In 1908, Edgewater citizens voted their town dry (citizens for - 133, citizens against - 89). The first school in the Edgewater area was built in 1891, near Colfax Avenue and what is now Harlan Street. A one room school made of logs, it had no official name and was known as “the hog hollow school” due to its proximity to a pig farm. Teacher Emma Hanson earned $50 for teaching that year. A brick schoolhouse, complete with a belfry for the bell which summoned children to class, was built in 1901 at 24th Avenue and Eaton Street. It had two rooms for students through 8th grade. If a student wanted further education, they could attend Wheat Ridge High School, which charged tuition of $4. In 1907 the two rooms were enlarged to four, and a "Mother's Circle" was formed, which later became the first PTA in Jefferson County. As the city of Edgewater grew up, so did other areas to the west of Denver. The county of Jefferson had been organized in 1859. By 1950, the 39 school districts in Jefferson County were consolidated and reorganized into a single district, Jefferson County R-1 Schools. In 1949, the current Edgewater Elementary was built, and then became part of the new school district. It was used for 1st through 4th grades. In 1954 a south wing was added, which allowed room for grades 5th through 7th, and the old schoolhouse was demolished. Our building was remodeled in 1996. Currently the school serves children kindergarten through 6th grade and has an enrollment of about 400. Our school building may not be new, but it is beautiful due to our colorful murals. These bright pictures make Edgewater a cheerful place to be, and we owe that to a local artist, Daniel Luna. Mr. Luna has painted the murals over a period of years, and we have used photos of them on this website. We are grateful to him for giving our school such a unique identity. Both the city and the school of Edgewater have grown and changed, of course. The city, having outgrown its wild-west beginnings, is now a comfortable place for families, with tree-lined streets and a small-town atmosphere. The battle against the mud has been won (1909 saw the first cement sidewalks), and we are all glad to know that the keeping of pigs within the city limits was outlawed in 1924. But there continues to be a strong feeling of community in both the city and our school. And although there are no longer Indians or elephants on its shores, people still flock to the flooded farmer's field that is Sloan's Lake. Allison, Judith. Edgewater: Four Score-History of a Town Sprung From Saloons. Jones, Celora Jean. Edgewater Colorado: A Centennial Celebration, 1901-2001. City and Mountain Views. 2006.